بنی عامریان, زهرا, مهدی پور, رامین. (1397). بررسی اثر نانو ذرات بر انتقال حرارت راهگاه آب موتور با در نظر گرفتن پدیده جوشش. نشریه پژوهشی مهندسی مکانیک ایران, 20(4), 54-77. زهرا بنی عامریان; رامین مهدی پور. "بررسی اثر نانو ذرات بر انتقال حرارت راهگاه آب موتور با در نظر گرفتن پدیده جوشش". نشریه پژوهشی مهندسی مکانیک ایران, 20, 4, 1397, 54-77. بنی عامریان, زهرا, مهدی پور, رامین. (1397). 'بررسی اثر نانو ذرات بر انتقال حرارت راهگاه آب موتور با در نظر گرفتن پدیده جوشش', نشریه پژوهشی مهندسی مکانیک ایران, 20(4), pp. 54-77. بنی عامریان, زهرا, مهدی پور, رامین. بررسی اثر نانو ذرات بر انتقال حرارت راهگاه آب موتور با در نظر گرفتن پدیده جوشش. نشریه پژوهشی مهندسی مکانیک ایران, 1397; 20(4): 54-77. در این مقاله اثرات افزودن نانوذرات به سیال عامل آب جهت خنک کاری موتور خودرو مورد بررسی قرار میگیرد. برای این منظور یک مدل سه بعدی CFD برای شبیه سازی جریان و انتقال حرارت در موتور خودرو یکبار با سیال عامل آب خالص و بار دیگر با نانوسیال مورد ارزیابی قرار گرفته است. تغییرات میزان انتقال حرارت موثر در خنک کاری خودرو با استفاده از نانوسیال TiO2 مورد بررسی قرار میگیرد. در نهایت نشان داده می شود که استفاده از نانوسیال 1% حجمی TiO2 قابلیت افزایش میزان انتقال حرارت را تا 37% بیشتر از سیال عامل آب خالص دارا است. Hosny, Z., and Abou-Ziyan, K., "Heat Transfer Characteristics of Some Oils used for Engine Cooling", Journal of Energy Conversion and Management, Vol. 45, pp. 2553–2569, (2004). Karamangil, M.L., Kaynakli, O., and Surmen, A., “Parametric Investigation of Cylinder and Jacket Side Convective Heat Transfer Coefficients of Gasoline Engines”, Energy Conversion and Management, Vol. 47, pp. 800–816, (2006). Lee, H.S., and Cholewczynski, L.W., “A Study on Convection and Boiling Heat-Transfer Modes in a Standard Engine Cooling System”, In: Proceeding of SAE VTMS6, Brighton, (2003). Ennemoser, A., "Engine Heat Transfer Boiling", AVL Report for IPCO, (2004). Hetsroni, G., Mudawar, I., and Kandlikar, S.G., “Two-phase Pressure Drop, Boiling Heat Transfer, and Critical Heat Flux to Water in a Small-diameter Horizontal Tube”, International Journal of Multiphase Flow, Vol. 28, No. 6, pp. 927-941, (2002). Steiner, H., Kobor, A., and Gebhard, L., “A Wall Heat Transfer Model for Subcooled Boiling Flow”, International Journal of Heat and Mass Transfer, Vol. 48, pp. 4161–4173, (2005). Choi, S., and Eastman, J.A., “Enhancing Thermal Conductivity of Fluids with Nanoparticles”, ASME International Mechanical Engineering Congress & Exposition, San Francisco, November, pp. 12-17, (1995). Kim, S.J., McKrell, T., Buongiorno, J., and Hu, L.W., “Enhancement of Flow Boiling Critical Heat Flux (CHF) in Alumina/Water Nano Fluids”, Advanced Science Letters, Vol .2, pp. 100–102, (2009). Kim, T.L., Jeong, Y.H., and Chang, S.H., “An Experimental Study on CHF Enhancement in Flow Boiling using Al2O3 Nano-fluid”, International Journal of Heat and Mass Transfer, Vol. 53, pp. 1015-1022, (2010). Lee, T., Kam, D.H., Lee, J.H., and Jeong, Y., “Effects of Two-phase Flow Conditions on Flow Boiling CHF Enhancement of Magnetite-water Nano Fluids”, International Journal of Heat and Mass Transfer, Vol. 74, pp. 278-284, (2014). Longo, G. A., and Zilio, C., “Experimental Measurement of Thermophysical Properties of Oxide–water Nano-fluids Down to Ice-point”, Experimental Thermal and Fluid Science, Vol. 35, No. 7, pp. 1313-1324, (2011). Farajollahi, B., Etemad, S.G., and Hojjat, M., “Heat Transfer of Nanofluids in a Shell and Tube Heat Exchanger”, International Journal of Heat and Mass Transfer, Vol. 53, pp. 12–17, (2010). Chehade, A.A., Gualous, H.L., Masson, S.L., Fardoun, F., and Besqet, A., “Boiling Local Heat Transfer Enhancement in Minichannels using Nanofluids”, Nanoscale Research Letters Vol. 8, pp. 1–20, (2013). Moreira, T. A., Nascimento, F.J., and Ribatski, G., “Flow Boiling of Nanofluids of Water and AL2O3 inside a 1.1 mm Round Channel”, In 9th International Conference on Boiling and Condensation Heat Transfer, Boulder, CO, (2015). Kim, S.J., McKrell, T., Buongiorno, J., and Hu, L.W., “Enhancement of Flow Boiling Critical Heat Flux (CHF) in Alumina/Water Nanofluids”, Advanced Science Letters, Vol. 2, pp. 100–102, (2009). Kim, S.J., McKrell, T., Buongiorno, J., and Hu, L.W., “Alumina Nanoparticles Enhance the Flow Boiling Critical Heat Flux of Water at Low Pressure”, Journal of Heat Transfer, Vol. 130, pp. 044501, (2008). Kim, S.J., McKrell, T., Buongiorno, J., and Hu, L.W., “Experimental Study of Flow Critical Heat Flux in Alumina-water, Zinc-Oxide-Water, and Diamond-water Nano Fluids”, Journal of Heat Transfer, Vol. 131, No. 4, pp. 043204, (2009). Kim, T.I., Jeong, Y.H., and Chang, S.H., “An Experimental Study on CHF Enhancement in Flow Boiling using Al2O3 Nano-fluid”, International Journal of Heat and Mass Transfer, Vol. 53, pp. 1015-1022, (2010). Kim, T.I., Jeong, Y.H., and Chang, S.H., “Flow Boiling CHF Enhancement using Al2O3 Nanofluid and an Al2O3 Nanoparticle Deposited Tube”, International Journal of Heat and Mass Transfer, Vol. 54, No. 9, pp. 2021-2025, (2011). Mehdipour, R., Baniamerian, Z., and Delauré, Y., “Three Dimensional Simulation of Nucleate Boiling Heat and Mass Transfer in Cooling Passages of Internal Combustion Engines”, Heat Mass Transfer, Vol. 52, pp. 957–968, (2016). 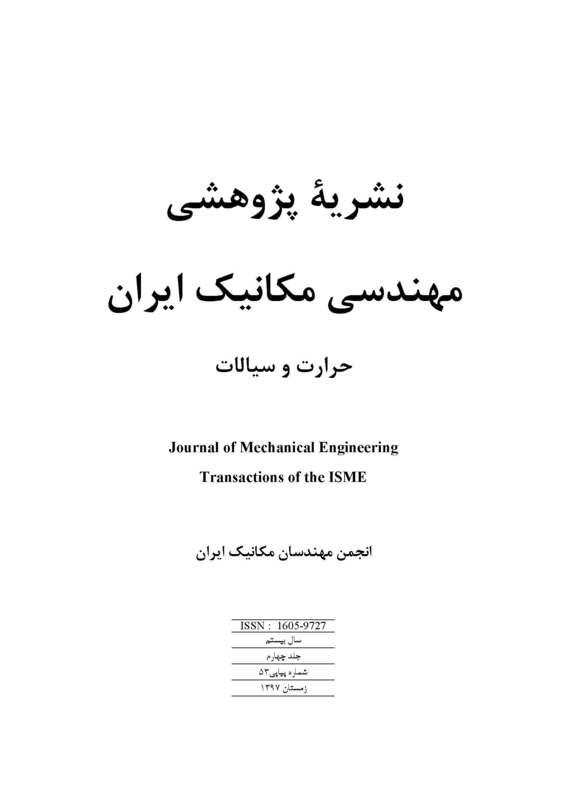 Mehdipour, R., Nazaktabar, M., Baniamerian, Z., and Aghanajafi, C., “Simulation of Heat Transfer in the Cooling Passages of the “EF7” Engine Considering Boiling Phenomenon”, Journal of Engine Research, Vol. 6, No. 19, pp. 63-72, (2010). Baniamerian, Z., Nazaktabar, M., and Mehdipour, R., “Simulation of Boiling Heat Transfer within Water Jacket of 4 Cylinder Gasoline”, International Journal of Engineering, Vol. 27, No. 12, pp. 1928-1935, (2014). Krepper, E., Konˇcar, B., and Egorov, Y., “CFD Modelling of Subcooled Boiling-Concept, Validation and Application to Fuel Assembly Design, Nuclear Engineering Design”, Vol. 237, pp. 716–731, (2007). Pak, B.C., and Cho, Y.I., “Hydrodynamic and Heat Transfer Study of Dispersed Fluids with Submicron Metallic Oxide Particles”, Exp. Heat Transfer, Vol. 11, Issue. 2, pp. 151–170, (1998). Corcione, M., “Empirical Correlating Equations for Predicting the Effective Thermal Conductivity and Dynamic Viscosity of Nano Fluids, Energy Conversion and Management, Vol. 52, No. 1, pp. 789-793, (2011). Zhao, J.J., Duan, Y.Y., Wang, X., and Wang, B.X., “Effect of Nano Fluids on Thin Film Evaporation in Micro Channels”, Journal of Nanoparticle Research, Vol. 13, No. 10, pp. 5033-5047, (2011). Hamilton, R.L., and Crosser, O.K.,” Thermal Conductivity of Heterogeneous Two-Component Systems”, Industrial Engineering Chemistry and Fundamentals, Vol. 1, pp. 187–191, (1962). Ameen, M.M., Prabhul, K., Sivakumar, G., Abraham, P.P., Jayadeep, U.B., and Sobhan, C.B., “Molecular Dynamics Modeling of Latent Heat Enhancement in Nano Fluids”, International Journal of Thermophysics, Vol. 31, No. 6, pp. 1131-1144, (2010). Christopher, C.Y., Tso, and Chao, Y.H., “Study of Enthalpy of Evaporation, Saturated Vapor Pressure and Evaporation Rate of Aqueous Nano Fluids”, International Journal of Heat and Mass Transfer, Vol. 84, pp. 931–941, (2015). Sanchez-Iglesias, A., Grzelczak, M., Altantzis, T., Goris, B., Perez-Juste, J., Bals, S., Tendeloo, G. V., Donaldson, S. H., Jr., Chmelka, B. F., Israelachvili, J.N., and Liz-Marzan, L. M.,” Hydrophobic Interactions Modulate Self-assembly of Nanoparticles”, ACS Nano, Vol. 6, pp. 11059–11065, (2012). Zhu, L., Gu, Q., Sun, P., Chen, W., Wang, X., and Xue, G., “Characterization of the Mobility and Reactivity of Water Molecules on TiO2 Nanoparticles by 1H Solid-state Nuclear Magnetic Resonance”, ACS Appl. Mater. Interfaces, Vol. 5, pp. 10352–10356, (2013). Strekalova, E. G., Mazza, M. G., Stanley, H. E., and Franzese, G., “Large Decrease of Fluctuations for Super Cooled Water in Hydrophobic Nano Confinement”, Phys. Rev Lett. Vol. 106, 145701, (2011). Garai, J., “Physical Model for Vaporization”, Fluid Phase Equilibria, Vol. 283, No. 1, pp. 89-92, (2009). Lee, S., Taylor, R.A., Dai, L., Prasher, R., and Phelan, P.E., “The Effective Latent Heat of Aqueous Nano Fluids”, Materials Research Express, Vol. 2, No. 6, 065004, (2015). Mehregan, M., and Moghiman, M., “Propose a Correlation to Approximate Nano Fluids”, Enthalpy of Vaporization - A Numerical Study”, Int. J. Materials, Mech. and Manufac, Vol. 2, No. 1, pp. 73-76, (2014). Moffat, R.J., “Describing the Uncertainties in Experimental Results”, Experimental Thermal and Fluid Science, Vol. 1, pp. 3-17, (1988). ASHRAE. Organization(s), ASHRAE Handbook, Fundamentals Covers Basic Principles and Data used in the HVAC&R Industry, (2017). Robinson, K., Hawley, J.G., and Campbell, N.A., “Experimental and Modelling Aspects of Flow Boiling Heat Transfer for Application to Internal Combustion Engines”, Proceeding of Institution of Mechanical Engineering Part D Journal of Automobile Engineering, Vol. 217, No. 10, pp. 877–890, (2003). Duangthongsuk, W., and Wongwises, S., “An Experimental Study on the Heat Transfer Performance and Pressure Drop of TiO2–Water Nano Fluids Flowing under a Turbulent Flow Regime”, International Journal of Heat and Mass Transfer, Vol. 53 pp. 334–344, (2010).